Tall buildings, a bustling metropolis, Victoria Harbour, The Big Buddha, Disneyland and DimSum. 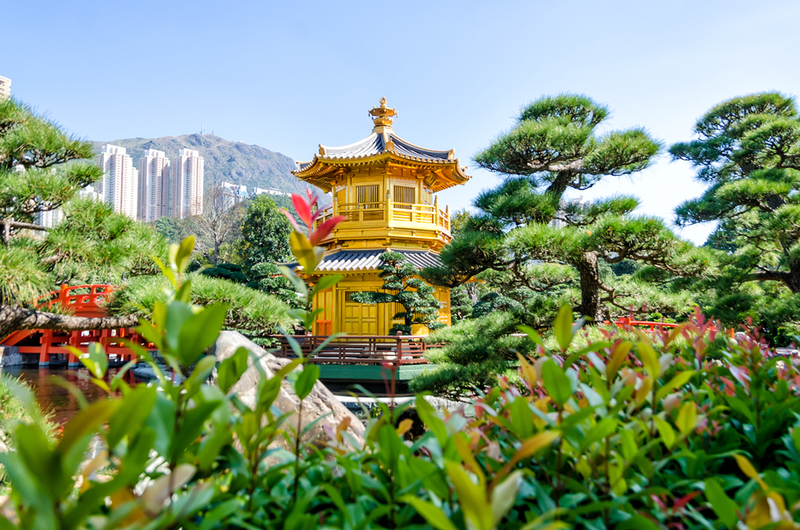 Are these some of your first thoughts when you think of Hong Kong? 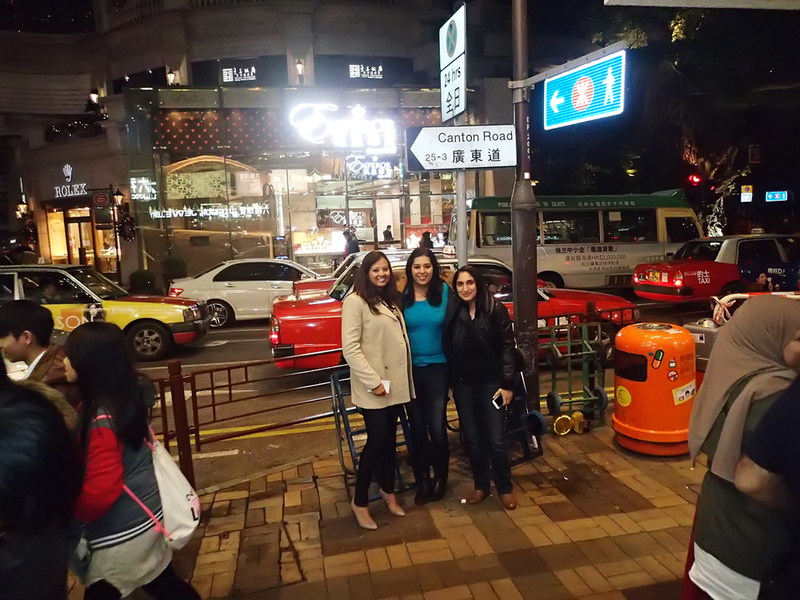 They certainly were mine, and Hong Kong was everything I anticipated and more. 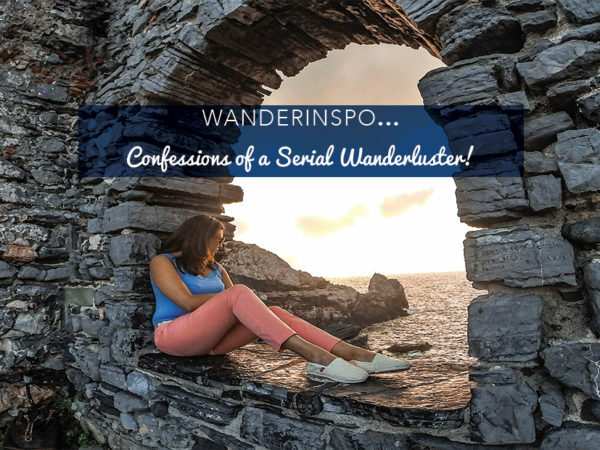 This country had been on my WanderList for the longest time and I was more than chuffed to finally be setting footsteps out here especially because I would be exploring not only with my WanderlustMate M but also with my sister which was something we had always dreamed of doing together! 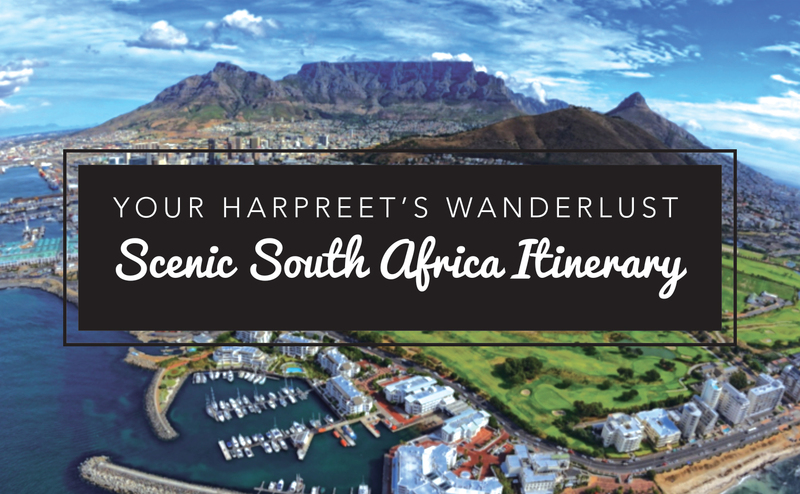 Welcome again, my dear Wanderlusters to Hong Kong through the eyes of Harpreet’s Wanderlust in this series of blogposts. Flying over the South China Sea, I peer out of the aeroplane window and cannot help but wonder where we are going to land because all I can see from the air are islands jutting out of the water and there seems to be no airport in sight! I had expected to fly past the Hong Kong skyline and had envisioned the ascent to be similar to landing in New Yorks JFK Airport but alas, not so out here! But, land we do and before I know it, we have cleared immigration, got ourselves into a red taxi and are soon whizzing towards Kow Loon and starting our adventures in Hong Kong! One of the first things we did was to get ourselves a Tourist Card on the underground network, the MTR and this lil gadget turned out to be invaluable in our jaunts in this country. 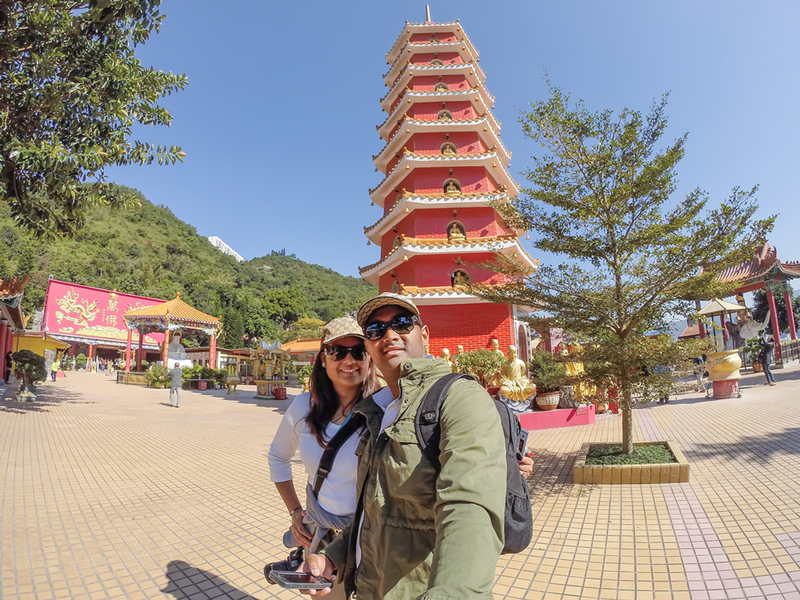 With so many places to explore, we whizzed around in no time at all without the hassle of dealing with taxis and the never ceasing traffic. Of course, one of the first things we did was head out to Tsim Tsa Tsui, which is THE perfect window seat to the skyline view of Hong Kong. Be it day or night, the sight of the skyscrapers on the other side of the Victoria Harbour never gets old. There’s something quite magical about skylines and the buzz of cities, but on the Kow Loon side the buzz is different from that of a typical city. 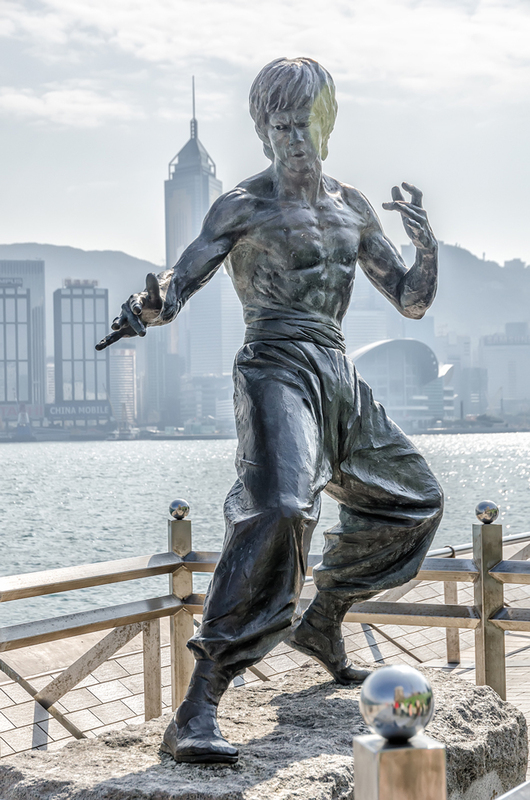 Being our first stop on our escapades in Kow Loon, TST was teeming with tourists and locals alike, ambling down the Avenue of Stars and hunting down statues, posing next to the likes of Bruce Lee and having fun with all the paraphernalia in the area. 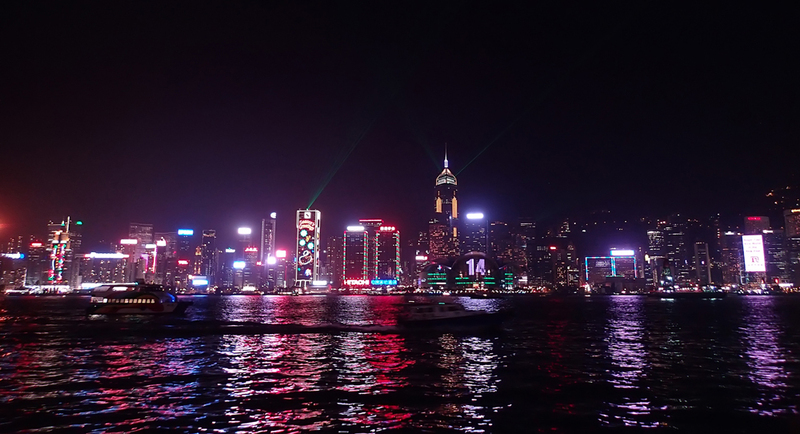 TST is even more gorgeous at night, bursting with life as everyone waits with bated breath to watch the twinkling lights come on and dance to the music of the Sound and Light Show, with the Aqua Luna bobbing up and down the harbour in tune to the music. 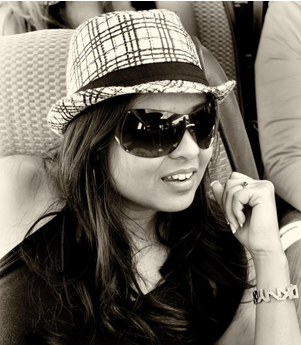 The atmosphere is buzzing with excitement and is just an ode to all the wonderful adventures out here! Now, I am a sucker for ambling around markets and the like, and where better than to indulge in a market than out here in Asia? Mong Kok quite lived up to my vivid imagination with its diverse shops, and is known as being home to the Goldfish, Bird and Flower Markets. Graced with a fishy smell, the goldfish market is flanked with rows of shops selling not just goldfish but also all other varieties swimming around in clear plastic baggies which are hung on the doors with large signs saying “No Photography” and the owners enforcing this rule quite strictly. After seeing a few, all the fish started to look the same and so we changed course and headed towards the Bird market, home to all sorts of tropical coloured birds. Not being the biggest fan of caged birds, I was more enthralled with the Flower Market, which was perhaps my favourite amble out in Mong Kok. 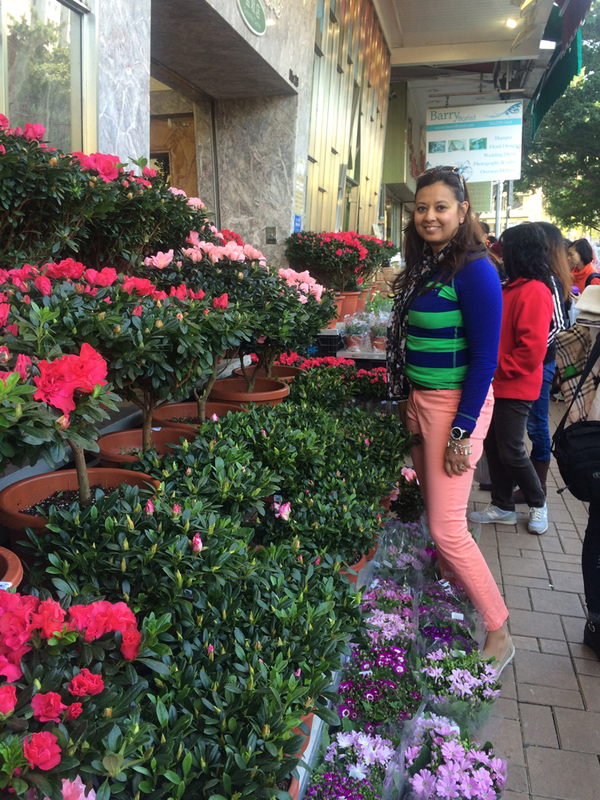 I was in flower heaven amidst the sweet floral scents, vivid, brightly coloured blooms and different varieties of plants and flowers. The market had beautiful blossoms in every direction, and the cutest garden paraphernalia and all I wanted to do was buy everything in sight and take it right back home! Well, sadly, all I bought were some flower seeds which I have since tried to grow and am waiting on tenterhooks to see sprouting! I am in Flower Heaven out here! 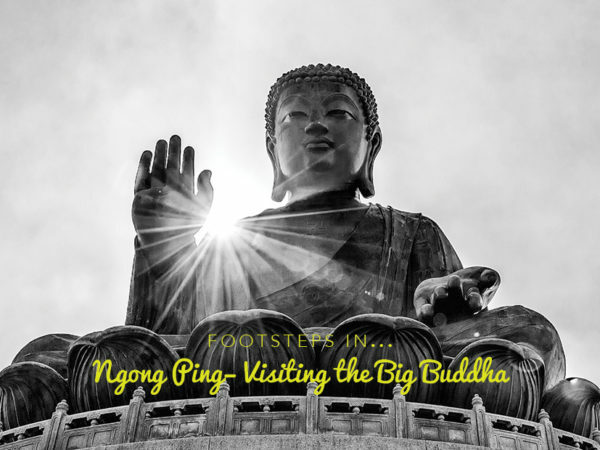 Adventures further afield in Kow Loon led us to Fook’s Hill in the New Territories, home to the 10,000 Buddha’s Monastery, which was quite a task to find and get to. Now, I wish that someone had told me that I would be getting a proper leg workout here in my quest to get to the Monastery which by the way, isn’t a working one. Folks, there are 621 steps that need to be conquered before you get to the top but the good thing is that there are Buddha images in various poses that accompany you all the way up and you can get your mind off the burn in your legs by counting them to see if they really are 10,000…I gave up at some point but they really do feel that many! Puffing and panting up the steps! The Monastery is at the summit of these steps, and has a couple of different levels and halls to amble around in. In the Hall of the 10,000 Buddhas, you will be convinced that this place is aptly named being dotted from floor to ceiling with miniature Buddhas all in various poses. Also quite pretty is the Pagoda of the Goddess of Mercy: Kuan Yin, and a very pretty Jade Emperors Hall. 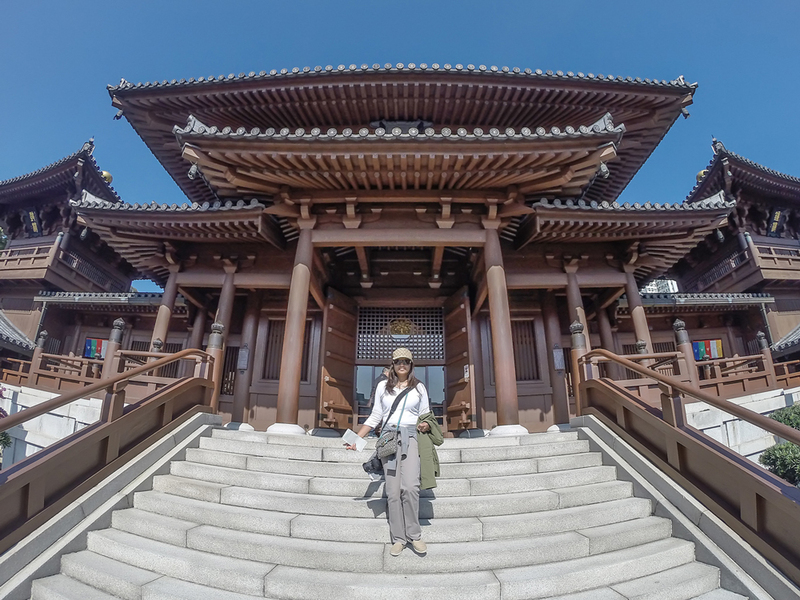 The cherry on the cake of this visit was our encounter with what we soon realised were fake monks, waiting at the foot of the 621 steps to lure us into their trap after we were done exploring the Monastery. We are generally quite cautious in our travels and on the lookout for any fishy behaviour, but we also don’t want to come across as unfriendly. So, when these two “monks” approached us with what looked like genuine smiles on their faces, we were on our guard but wanted to give them the benefit of the doubt and so we listened to what these sweaty men clad in black garb had to say. At one point we were almost convinced that they may be genuine because they chanted some gobbledygook and “blessed” us. The game was given away when they forcefully adorned us with mantra beads and started asking for “donations” for the “blessing” and the penny dropped when they made a sudden switch from charming to almost aggressive! Given that there were 4 of us and 2 of them and seeing that there were cops lurking around, we took a chance and simply put their mantra beads back into their hands and walked away, with them hurling abuse at us no less! Something we chuckle about now but at the time could have turned ugly, and thankfully didn’t! Fake monks, many steps and all, I would still recommend a visit to this Monastery, because it is off the beaten path of so many visiting Hong Kong. A celebratory hug for making it up to the top! 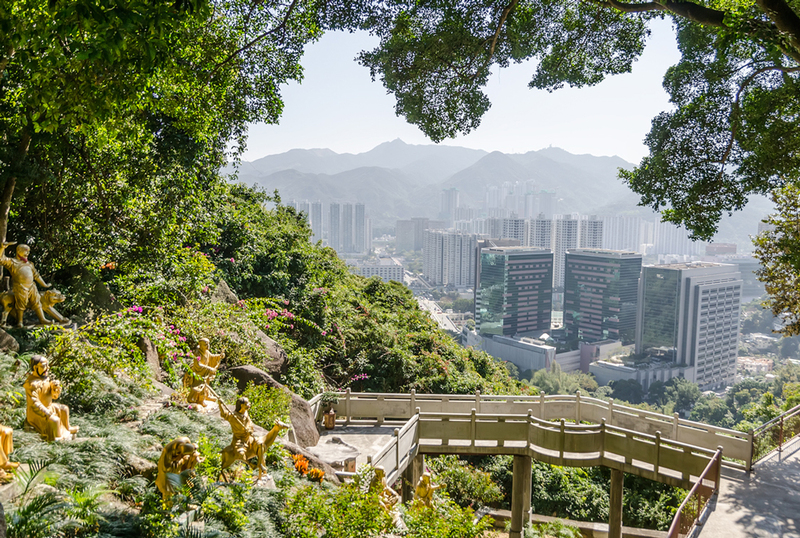 Diamond Hill is the home to the serene Nan Lian Garden and Chi Lin Nunnery. This tranquil park cuts through the residential area and you can spend quite a few hours marvelling at the meticulously landscaped garden, where every hill, rock and body of water has been placed according to ancient principles embodying yin and yan creating an atmosphere of zen in an otherwise bustling city. 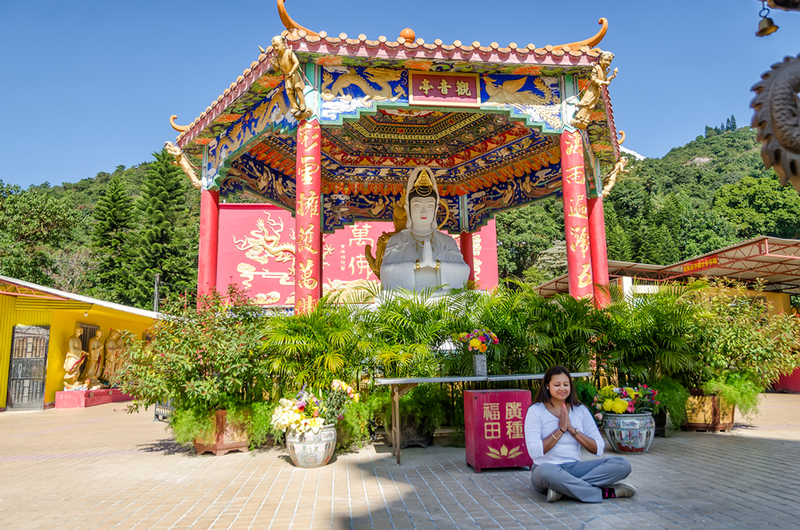 The Nunnery is part of the garden and consists of a large temple complex made from wood that houses various Buddha relics. My favourite part of the Nunnery were the beautiful Bonsai fruit trees which were actually flowering! The mini oranges were fascinating to see. It is easy to spend a good couple of hours in both these places, and if like me, you enjoy nature then there are many nooks and crannies in both the garden and the nunnery where you can hide away and let nature do her thing. No trip is complete without indulging in some signature cuisine, and I had my WanderList of things I wanted to try out here in Hong Kong. Top of that list were Dim Sum, and we did try to go to a highly recommended local Dim Sum place but the menu was written in Chinese and being none the wiser, we opted to try Din Tai Fung instead. Talk about Dim Sum heaven! There’s every kind of Dim Sum you could imagine on the menu and we could easily have spent a couple of hours eating! I am now totally spoiled and no Dim Sum tastes as good as the ones we ate at DTF. 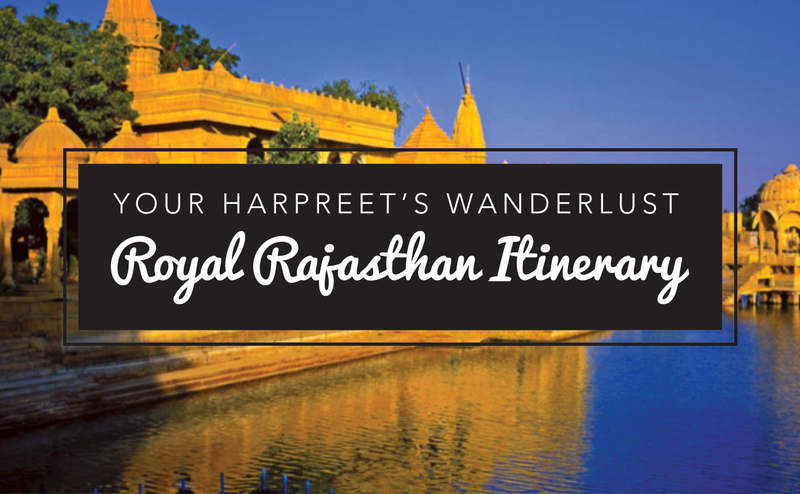 Do check it out if you are out in this part of the world. Being a huge fan of Peking Duck, I wanted to get my dose made the “original” way, and having been told that the best is to be had at the Peking Garden on Canton Road, promptly made a reservation to indulge in this delicacy! Peking Garden is a huge family style restaurant that serves, you guessed it, Peking Duck as its main delicacy, as well as other Cantonese dishes. The only way to enjoy this is to simply go with the flow and indulge the experience: order a whole duck, watch it being cut into pieces and dig right in: stacking up your morsels of meat with onions, cucumber and hoisin sauce on the pancake! Indeed, I am none the wiser if this isn’t the best place to eat this dish but it certainly lived up to its reputation because it was scrumptious. The duck had all the right flavours; it cooked to perfection with a crisp, sweet skin and best of all had none of that “ducky” aftertaste. 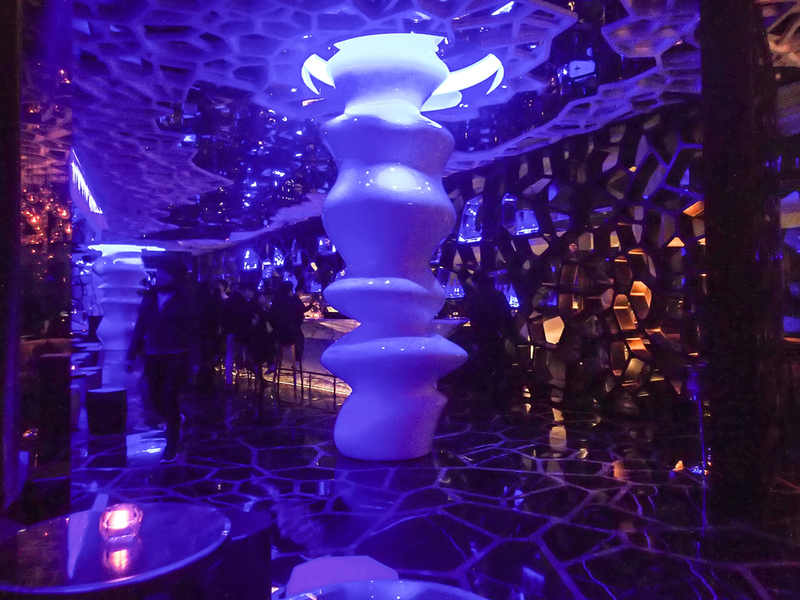 And, of course, I couldn’t not go to the “Highest Bar in the World” : the one and only Ozone Bar at the swanky Ritz Carlton Hotel for a drink. Indeed, its height means that it has sweeping, uninterrupted views of the skyline and Victoria Harbour. The bar is chic, elegant and yes, the views are spectacular but as you can imagine, sitting by a viewpoint at this bar isn’t exactly pocket change! You have to pay a set amount to grab a table next to a viewpoint, or lurk around the patio and grab a table when someone leaves unless you make a reservation in advance. Anyhoo, given that all we wanted was a drink, I am glad to say that I checked this off the WanderList and indulged, wrapping up some pretty fun footsteps in Kow Loon! 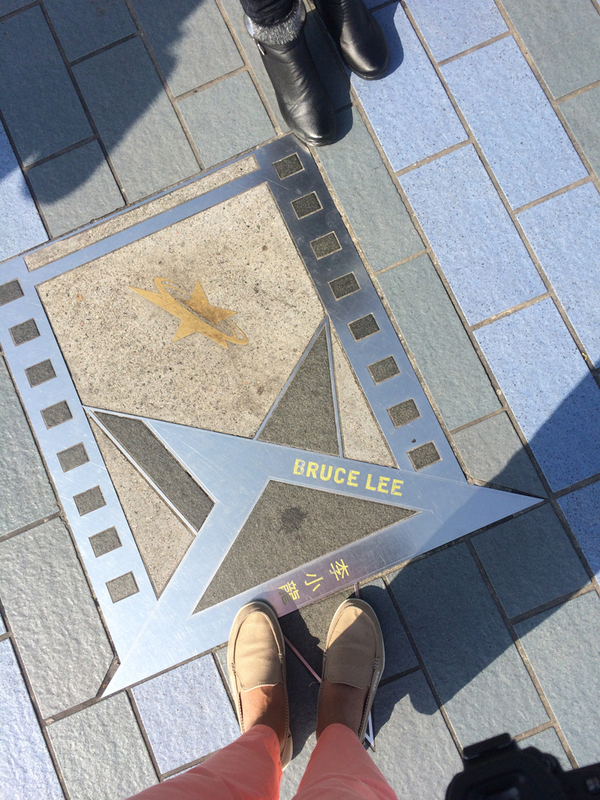 Stay tuned my dear readers, for more footsteps out in Hong Kong and thank you for spending a part of your day with me! 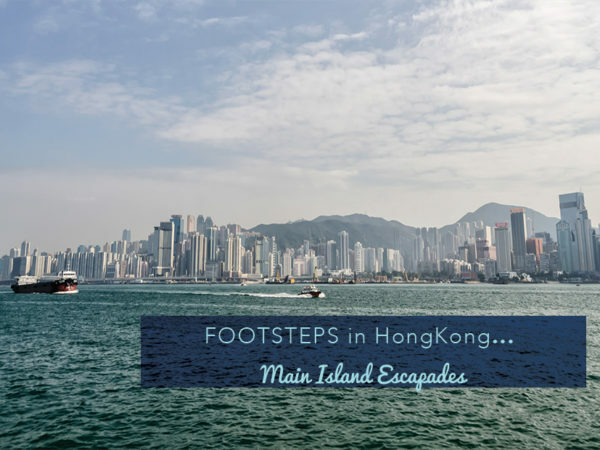 Of course this is quite a personal decision however I must admit that I when I researched just how much there is to do out in Hong Kong, the perfect location to stay in was top of my list. We eventually settled on staying on the Kow Loon side which turned out to be a great decision because it was a great central point from where to explore. It is easy to get a taxi to your destination even if you don’t have pre-arranged transport. The taxi stand is outside the Arrivals Hall and clearly signposted. Hong Kong taxis operate by colour and there are three colour coded taxis, depending on where you are going. Red taxis go anywhere in Hong Kong except Lantau and Tung Chung Road, Green taxis go to the New Territories and Blue taxis go to Lantau and the airport. If you are heading into Kow Loon or Mainland Hong Kong, you will use a Red Taxi. Taxis in my experience are expensive and the drivers curt to the perceived point of being rude. The easiest way of getting around is by getting a Tourist Card and using the Metro. This underground train network known as the MTR is akin to the “Tube” in London and is the quickest and cheapest way to get around. There is always an MTR stop nearby that will connect you to where you want to be. If you know how to read a tube map, this website will tell you all you need to know about the MTR: http://www.mtr.com.hk. A Tourist Card may be purchased at any sales office at any Metro stop. 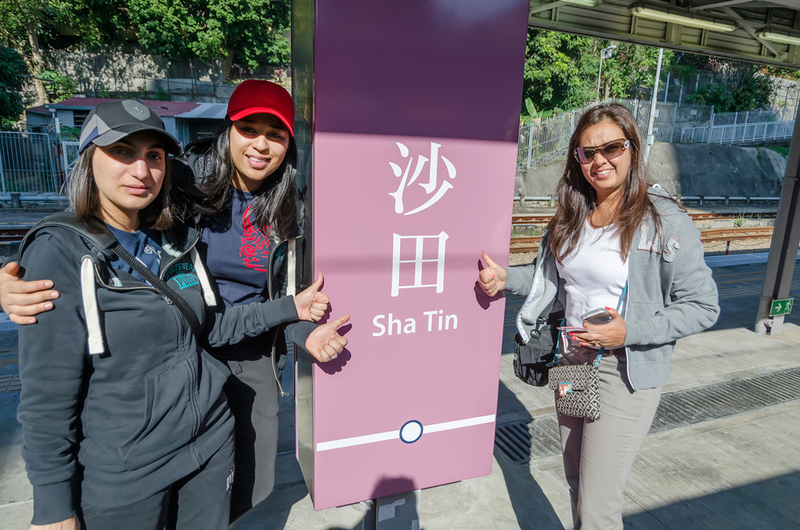 On the Metro, make your way to Sha Tin Station, and use Exit B taking the ramp alongside the bus terminus down to street level. 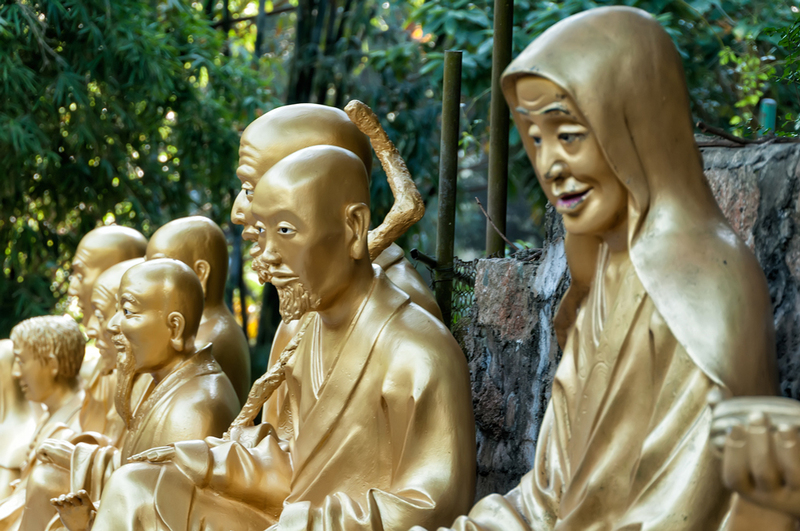 There are no signs for the Monastery so follow the blue direction signs to Sha Tin Government Offices then follow Sheung Wo Che Road alongside these offices to the end of the road where you will see a yellow direction sign for the monastery. The stairs lie about 30-metres beyond. The walk from the station to the start of the path leading up to the monastery takes about ten minutes. On the metro, make your way to Diamond Hill Station and take Exit C2. 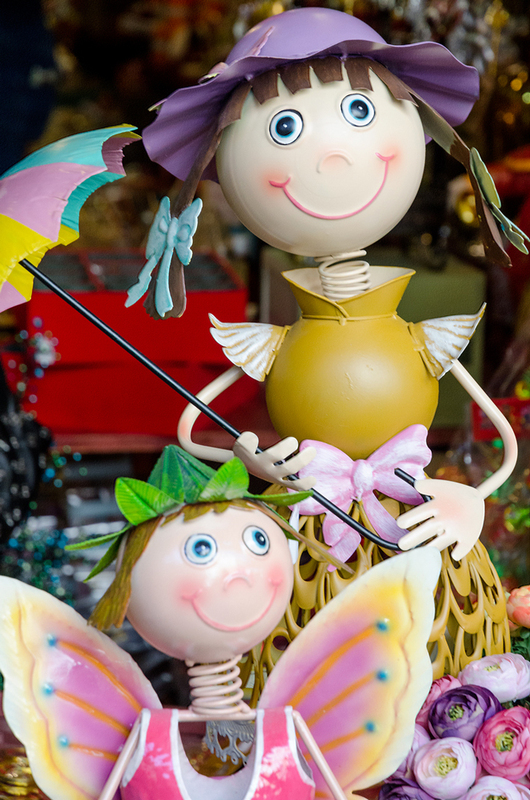 Follow the signs for the garden – it is a five minute walk from the MTR stop, through the Hollywood Shopping Centre. 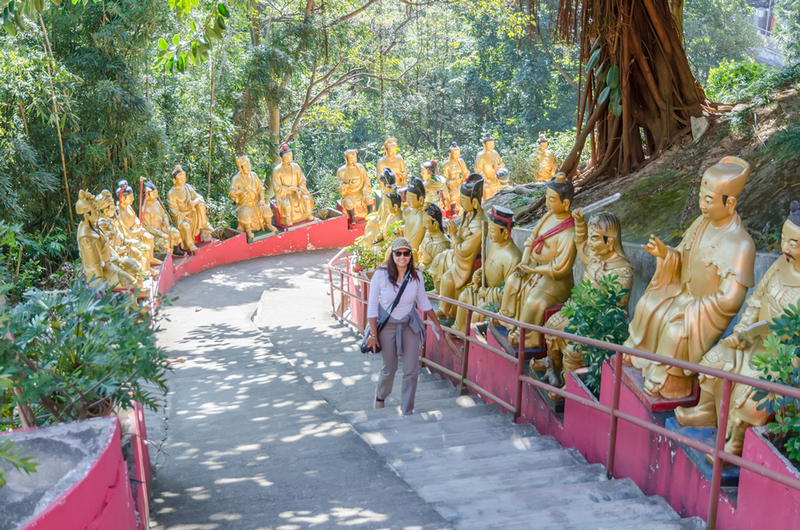 The easiest way of accessing the Nunnery is through the Nan Lian Garden. Haha yes please! We gotta go back! This brought back so many awesome memories!!! Thank you for planning the entire trip it was amazing <3 and we need to go back!!!! Awww thank you! Indeed was an amazing trip and we have loads to giggle about! Loads more still to come! To Footsteps…Cheers!